Chichester Library will once again be playing a full and active part in this year’s Festival of Chichester. Pop-up Theatre: Bear Hunt. Chichester Community Theatre presents a pop-up theatre production of Bear Hunt, a specially-commissioned play written by Lucy Flannery: Robert has been looking forward to his retirement but things aren’t going as planned. He can’t change the weird light bulb and there’s something very, very wrong with his wife. Directed by Roger Redfarn. Saturday, June 30 and Saturday, July 7, 12 noon, Chichester Library. Free drop-in, no tickets required. A Celebration of the English Language, Chichester Writers’ Circle members. 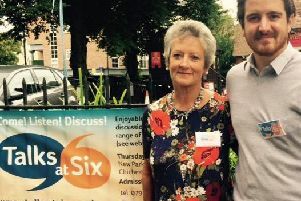 Chichester Writers’ Circle has existed for more than 30 years. Join them for an evening of readings of poetry and prose written by members. Tuesday, July 3, 7.30pm, Chichester Library. Tickets: £5 each available from Chichester Box Office only. Storytime with children’s author Barbara Cluff. Sing along with the red squirrel, Cartwheeling Chestie Nut, who through his adventures, learns about life. In Nic and his Nutty N’Uncle, find out how to make a perfect cup of tea, improve a stew, and ballet dance with the stars. For ages seven years and under. Saturday, July 14, 11am-11.30am, Chichester Library.